Candlewick Press, 2015. 456 pages. I’m not sure why this book is marketed for young adults rather than old adults, except that it’s super interesting, contains lots of photographs, and isn’t written in tiny print. The story doesn’t pull any punches or hide any of the horrors of war, nor does it focus on the time in Shostakovich’s life when he was a young adult. But yes, it’s interesting for young adults, as any well-written narrative nonfiction would be. The book begins with a prologue that piques the reader’s curiosity. The first scene is of a Russian agent smuggling a small box of microfilm to an American agent in 1942. The microfilm has come through Tehran, Cairo, and Brazil on its way to New York City. The contents of the microfilm? The Seventh Symphony, the Leningrad Symphony, by Dmitri Shostakovich. Why had the Soviet government arranged so carefully for this piece to be shipped to the West across battle lines, across a Middle East that was swarming with Fascist tanks, across seas festering with enemy subs? How could it possibly be worth it? And who was the composer of this desperately sought-after score? Dmitri Shostakovich spent the first several months of the Siege of Leningrad trapped in that city under fire, writing much of his Seventh Symphony in breaks between air raids. He had first announced that he was working on the piece over the radio in September 1941, just a few weeks after the Germans had started shelling the city. . . .
M. T. Anderson does tell the story of Shostakovich’s Leningrad Symphony and thoroughly explains why it was so important and why symphony orchestras all over the world wanted to perform it. But more than that, he tells the life story of Dmitri Shostakovich and the story of St. Petersburg, the city of his birth, later called Leningrad. This story requires telling the story of Communism coming to Russia, with the rise of Lenin and Stalin. And then it tells the story of World War II, and how at the outset Stalin believed Hitler’s promises and eliminated Russian military leaders who told him otherwise. The majority of the book, though, is about the Siege of Leningrad, during which Shostakovich wrote his Seventh Symphony. This siege lasted 872 days – the longest siege in recorded history. Hitler had decided he didn’t need to attack the city – it could be starved. The story is not pretty. The author doesn’t shy away from the deaths – and the cannibalism. 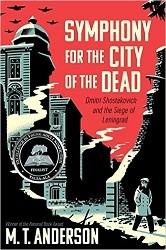 Shostakovich was evacuated from the city before the end of the siege, but the author still fills us in on what was happening in Leningrad where Shostakovich’s sister was still living. Especially poignant is the story of the musicians who were still alive in Leningrad assembling to perform the Seventh Symphony. Naturally, while reading this book, especially the description of the symphony, I had to look up a performance on the internet and listen. Knowing the background made it far more meaningful. Notes in the back explain the difficulties associated with piecing together this story. As M. T. Anderson asks, “How do we reconstruct the story of someone who lived in a period in which everyone had an excuse to lie, evade, accuse, or keep silent?” This book is an amazing piece of scholarship wrapped up in a gripping narrative and sprinkled with an abundance of photographs. If you are at all interested in the life of Dmitri Shostakovich, the fate of musicians and artists under the Soviets, the rise of Communism in Russia, World War II and the Russian Army, or the City of Leningrad, you can’t find a more absorbing way to learn more than reading this book. This entry was posted on Saturday, August 13th, 2016 at 8:57 pm and is filed under History, Nonfiction Review, Starred Review, True Stories. You can follow any responses to this entry through the RSS 2.0 feed. You can leave a response, or trackback from your own site.